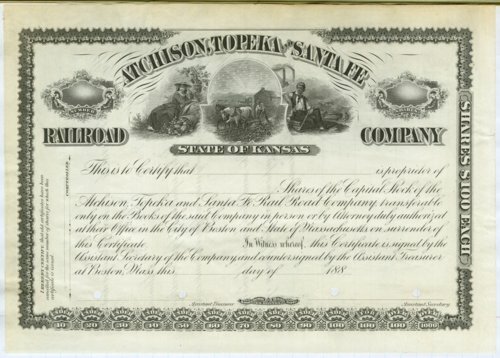 This is an Atchison, Topeka & Santa Fe Railroad Company stock certificate. At the monthly director's meeting held, August 7, 1883, in Boston, MA, they approved issuing certificates of stock from number A.1 issued August 1, 1883, forward. The directors decided that certificates would be signed by the Assistant Secretary, countersigned by the Assistant Treasurer, and certified across the left end by the Comptroller. The shares were valued at $100 each and they were issued in the State of Kansas.